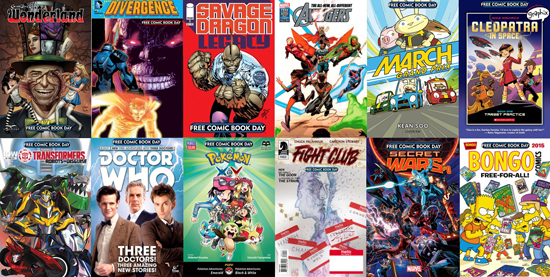 Dig That Box Celebrates Free Comic Book Day 2015! 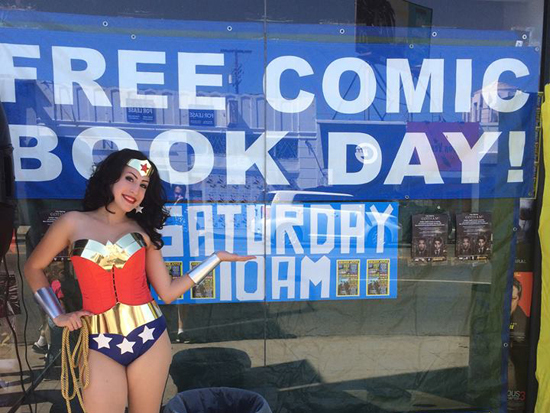 A gloriously sunny first Saturday in May can only mean one thing here in Los Angeles...Free Comic Book Day! Once again, I made the journey to my favorite comic shop, Golden Apple Comics. By the time I got to the shop about a half hour prior to the 10am scheduled opening, there was well over 150 people in line! I saw a lot of kids wearing capes and masks, even an adorable four year old dressed as Thor. Once the doors opened, the staff was letting in a few people at a time so as not to create an unnecessary crowd inside. There was a secondary room set up next door to the shop where most of the free comics were available in addition to some sweet sale items! There were boxes upon boxes of recent comic books that were on sale, 2 for $1! There was also a few boxes of older Star Wars figures and various graphic novels for $5. Donations were also being accepted for the Hero Initiative. If you're unfamiliar with Hero Initiative, I suggest you look it up and consider donating to this worthwhile cause. (http://www.heroinitiative.org/) If you are a fan of any Golden Age or Silver Age comics, you'll understand why this is such an important cause. Spinning comic and pop culture themed music was DJ PDub. If only I could listen to music like the Wonder Woman theme while I shopped for my comic books. Speaking of Wonder Woman, there was a cosplayer there dressed as our favorite Amazonian warrior. She delighted the fans and posed for tons of photographs. 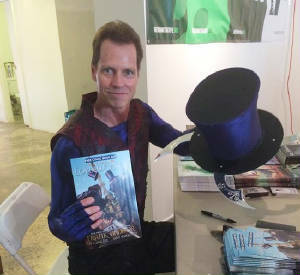 At noon, at the back of the room, the creator of Hatter M., Frank Beddor arrived and signed copies of his novels as well as the Hatter M comic that was one of the free comics on this day. But he wasn't the only special guest as I learned when I went into the main shop next door. David Flores was on hand to sign copies of Dead Future King as well as provide free sketches of his characters. The line was long but moved briskly. Also on hand, writer and creator Siike Donnelly was on hand giving away free sketches of Ant Man. Naturally, these were very small sketches! There was a massive 20% off store wide sale going on. In front of the store, there was a large variety of snacks and beverages available for purchase as well as a pretty sweet table full of free swag. There were posters, t-shirts, sunglasses, Blu Rays and other miscellaneous tchotchkes. Of course, it all went fast but it was a nice added bonus, particularly for those who waited the longest in line prior to store opening, for they got first crack at the good stuff. Once again, I had a fantastic day at Golden Apple. Free comics, free swag, awesome music, cheap comics and toys, big sale, cheap snacks and the friendliest staff around. Is there any wonder why Golden Apple Comics has been an LA staple since 1979? Is there any question as to why I love this shop and where I'll be come Free Comic Book Day next year? I think the answers are obvious. EXCELSIOR!